Your skin contains about 30% of the total water content of your body. And maintaining this percentage is vital to keep your skin elastic and plump and prevent loss of moisture due to environmental factors. If your water intake is low, your skin cannot prevent the excessive water loss, and it will lose its resiliency. Adequate water intake maintains the skin density and thickness and prevents loss of moisture, which keeps your skin healthy . Your kidneys need water to flush out toxins from your body. The kidneys filter the waste from your bloodstream so that your organs receive pure and oxygenated blood. Your skin receives the essential nutrients and oxygen through blood. And unless your blood’s clear, your skin will not glow. From preventing water loss and eliminating toxins to synthesizing vitamin D and protecting your body from sun damage – your skin performs multiple functions every day. Daily intake of adequate levels of water helps your skin function effectively. A study evaluated the effect of drinking water on human skin hydration levels and other functions. The subjects drank about 2 liters of water every day for one month. The results showed that drinking water not only helped in maintaining and improving the normal physiology of the skin but also enhanced superficial and deep skin hydration levels . 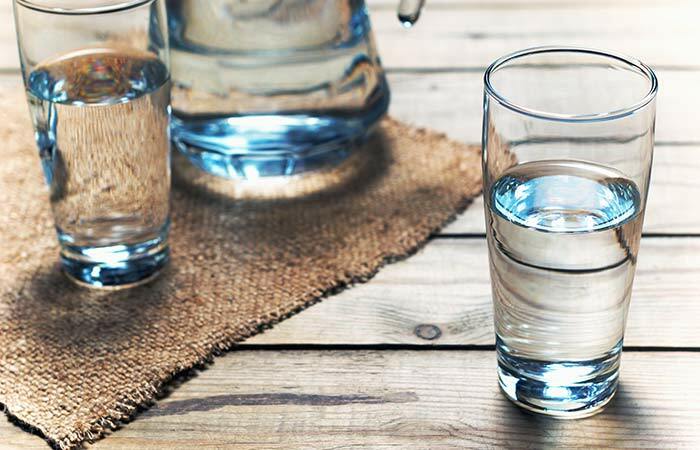 It’s pretty evident that water intake plays a crucial role in keeping your skin healthy. Let’s understand how you can follow the Japanese water therapy to keep your skin healthy and glowing. Before we proceed to the steps, here’s some encouragement for you! A study says that drinking water can also help you in losing weight by increasing the number of calories you are burning every day. When you drink enough water, your Resting Energy Expenditure (the calories your body needs when you are not active) increases. All this happens due to the thermogenic effect of water . Note: Thermic effect is the number of calories your body spends to process any food item. I guess this is enough to get you excited about water therapy. Now, let’s move on to the steps. Drink at least four to six glasses of water right after you wake up in the morning. Each glass should hold 160-200 ml of water. Do this on an empty stomach. The water should be at room temperature or lukewarm. Note: You may squeeze a lemon into it. Brush your teeth after you have drunk the water. Do not eat anything for the next 45 minutes. Carry on with your daily routine after that. During the 45 minutes, you may do light physical activities, such as jogging or yoga. Maintain a gap of two hours between every meal you have throughout the day. And during these two hours, avoid drinking and eating anything. For instance, after 15 minutes of having your breakfast, lunch, evening snacks, and dinner, do not eat or drink anything for the next two hours. If you cannot drink four to six glass of water at one go, take a break for a couple of minutes between every glass of water. There are a few pointers to keep in mind before you even think of starting water therapy. Take a look. If you are elderly or have any health issue but still want to go ahead with this therapy, start with one glass of water every day and then gradually increase the amount. Avoid caffeine and alcoholic beverages while you are undergoing this therapy. Do not drink excess water. Overdoing this may cause water intoxication, which is fatal. Always consult a doctor before starting any alternative therapy. The daily amount of water required differs from person to person. It depends on your fitness levels, climatic conditions, age, and weight. Water is not only a source of life on this planet, but it is also equally important for maintaining your quality of life. Do not wait anymore and take your first step towards glowing skin and a healthy body. Start water therapy today! And if you have already tried this therapy, share your experience with us in the comments section below.